Midwest Graphics is your source for quality, eye-catching graphic displays. From signs and banners to wall and floor graphics...WE DO IT ALL!!! Midwest Graphics is a large-format printing company offering high-quality visual solutions for our customers. Since opening our doors in 1995, we have been committed to providing excellence in print production and customer service, combined with quick turnaround times. And not only can we do custom signage, we also do custom graphics for your interior needs. We specialize in, custom signs, interior graphics, wall and window signs, Flags, 3D sign letters, retail signs and POP, corporate signs, church signs, school banners, ADA signage, and Trade Show Displays. We custom design, fabricate and install custom signs and interior/exterior graphics for businesses throughout Central Ohio. Since 1995 we have focused on excelling in quality and craftsmanship while offering our clients timely and professional services. Midwest Graphics also has experience with fleet vehicle graphics and can design, install, and uninstall vinyl right here in our facility. Other services include full finishing capabilities like laminating, CNC routing, and banner sewing. We can print direct to substrate with our Vutech CMYK plus white printing capabilities. Other sign companies call on us to help with overflow! Other areas of expertise are: baseball/tennis custom mesh, light pole banners, construction and street signage, Trade show exhibits, promotional items, flags, and company logo wear. We set ourselves apart from other printers with our full finishing and fabrication capabilities. In other words, if you can think it up, we can make it...all in-house! At Midwest Graphics we specialize in making your company look its best. We strive to provide the highest quality in printing with the best in customer service. We are passionate about our work and our strong commitment to excellence. We never say "no" to a request, and our clients would tell you we over-deliver and make EVERY deadline. Midwest Graphics is a privately held, woman-owned company that was originally established in 1995. 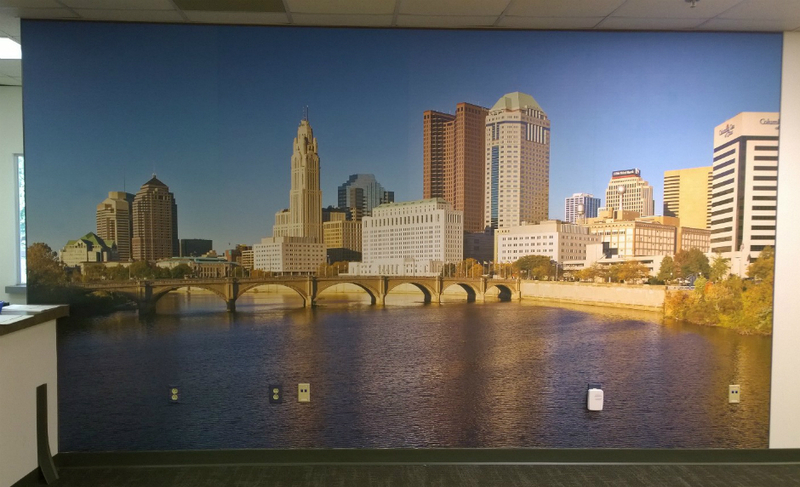 We have expanded our offerings over the years and now provide signage and graphics to businesses all over Central Ohio and even the United States. Our emphasis is first and foremost to provide marketing support to you, our customer. We are an extension of your Brand and we want to be a part of your team! Just ask any of our customers. Better yet, call us and we will show you! A vendor of Ohio Wesleyan University for the past 5 years, Midwest Graphics has helped beautify and brand our campus. I'm consistently impressed with how fast they respond to our needs and the expertise they bring with every install. Gayle and her team at Midwest Graphics solved a technically challenging installation that involved two separate window treatments across four floor-to-ceiling windows. In the course of just a few days, they were able to print and install a large-scale, seamless graphic to deliver maximum impact at a highly visible downtown intersection. Senior Director of Marketing, CrossChx, Inc.
© 2019, Midwest Graphics. All Rights Reserved.